i’m sorry it’s been over a year since i last pulled you out of my cupboards. please accept my apology and i promise to put you to more use in the next 12 months. 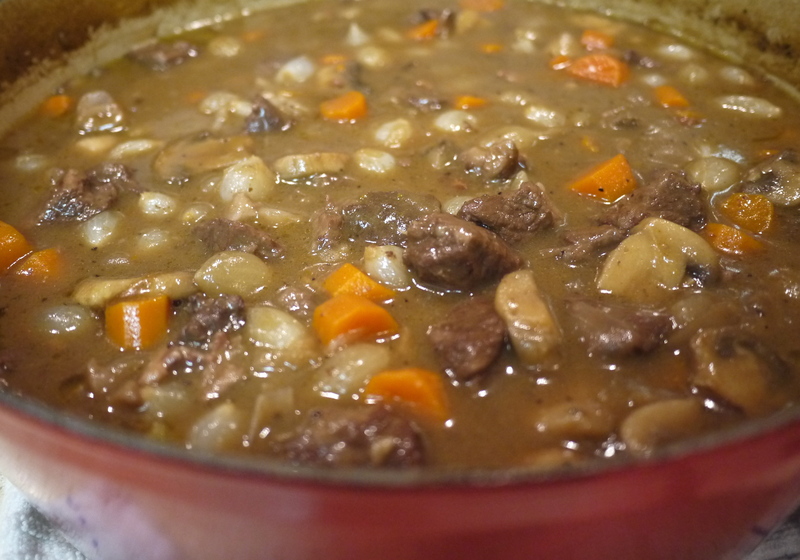 the idea to make boeuf bourguignon came after i watched julie & julia. since i didn’t know how to pronounce it properly, i’d jokingly refer to it as boeuf-de-coeuf or beef bourgeoisie. and to this day, i still don’t really know how to pronounce it. nor will i ever. i’d say that this dish was easier to make than to pronounce. Preheat oven to 375. Saute bacon over medium-high heat until browned in french oven. Remove bacon and set aside. Saute the beef cubes for 5 minutes, until browned on all sides. Add carrots and yellow onion to pot, cooking for another 10 minutes. Add back the bacon, garlic, thyme, and S&P. Add the beef broth and entire bottle of wine. Bring to a simmer. Once simmering, place the lid on the pot, place it into the oven for 2.5 hours @ 375 degrees. After 2.5 hours, remove the french oven from the oven. Saute the mushrooms in EVOO until wilted and mix into stew. Heat the butter. When the butter is half melted, add in flour and stir until a roux is formed (slightly paste-like). 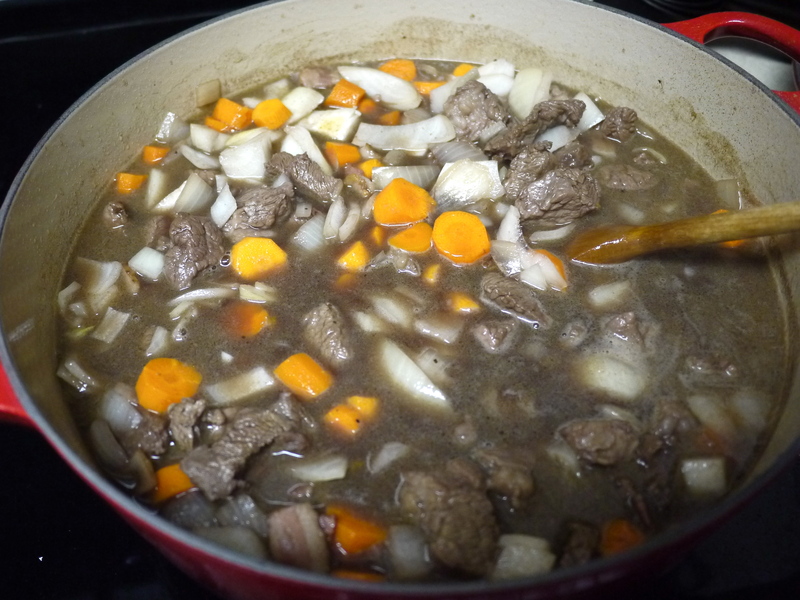 Mix the roux into the stew. Pour in the frozen pearl onions, cover the pot, and place it back into the oven for another 30 minutes @ 375 degrees. After 30 minutes, remove the french oven from the oven and heat over medium-low heat until ready to serve. Boil the egg noodles, add EVOO in the water to prevent noodles from sticking. 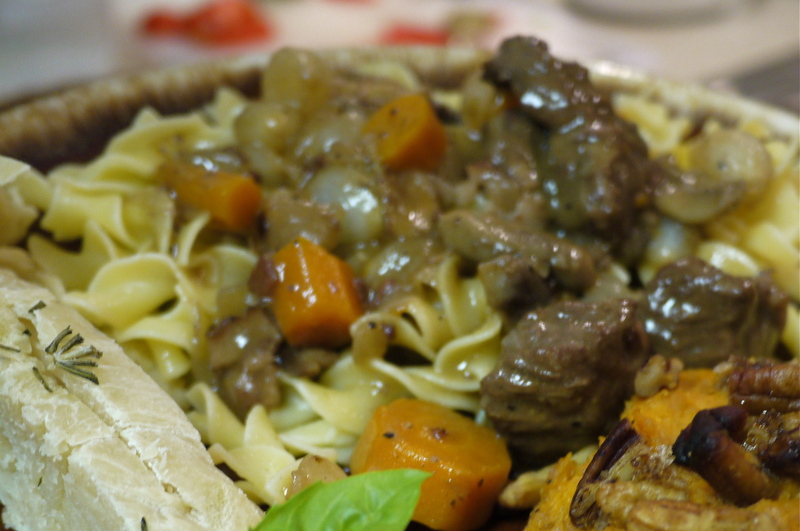 Ladle a GIANT scoop of boeuf bourguignon over the egg noodles and serve. we wanted to devour it so fast that i almost forgot to take a picture with the egg noodles. the picture is kind of blurry, but you’ll have to trust me that it was SOOO good. family potluck with boeuf bourguignon (me, Josh, Stephen), sweet potato casserole (Josie & Andrew), rosemary bread (Ada), caprese salad (WilLo), brownies (Jessie), creme brulee (me, next post! ), and topped off with orange jello shots (Andrew) = COMPLETE SUCCESS. Let’s do it again soon! ← i cooked a whole fish!